Munt’s piano factory once stood in Wilcox Road. 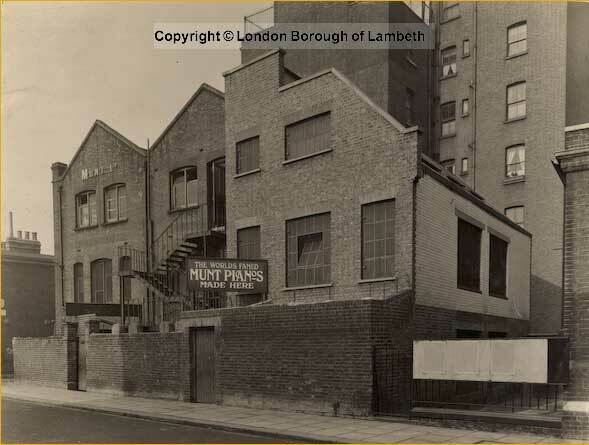 My grandfather Cornelius Munt and his brother Norman were the last of the Munt brothers to make pianos at 69 Wilcox road Brixton until 1935 when they sold the factory to Chappells. My father has fond memories of going round the factory with his father, and up and down the piano lift. Not only did they make their own pianos, but during the years between 1914 and 1926 the actions of many British pianos came from the Munt factory due to the cessation of imports from Germany, and the Munts had fortunately always made their own. Another contributor notes that Chappells’ archives were lost in a Bond Street fire (in 1964?) and probably Munt’s archives with them.